Susan fondly remembers her sports law experience at Marquette, but it was a first-year torts class that may have inspired her to the area of law in which she practices today. “I remember reading cases about things that could really happen in everyday life, and seeing how the legal principles applied to them,” she says. Susan is a partner at Stafford Rosenbaum LLP. She recently was named practice team leader for the firm’s litigation team. 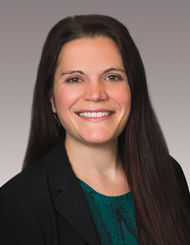 Her practice includes commercial litigation, with a focus on automobile product liability. Susan also volunteers with the Milwaukee Justice Center, the Junior League of Milwaukee and the Holton Street Clinic. When Susan was in grade school, she wanted to be a historian because she enjoyed research and learning personal stories about people who lived in the past.